In anticipation of the release of version 3 of the TMF Reference Model and in honor of David Letterman’s last “Late Show” appearance, this post mimics his famous Top 10 list. 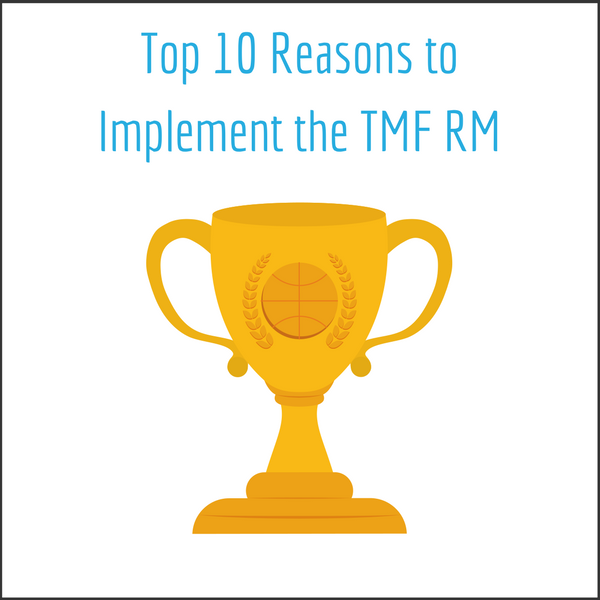 Here are the Top 10 reasons to implement the TMF Reference Model. Enjoy! While a clear, concise comparison of a company’s standard practices and SOPs to the Reference Model (RM) are vital, it is safe to say that the reference model is a fairly comprehensive document and the document in question has an artifact number and name on the RM. #9. The Regulatory Agencies are familiar with the content and format. With the current microscope on the TMF, chances are the regulatory agencies will find something in your TMF that they will not like (it may not necessarily be a finding), but the good news is that you can rest assured that many other companies have been through inspections utilizing the same tried and true model. #8. The model is easy to follow. Please do not be intimidated by a 30 column 200+ page spreadsheet! Once you get used to the column headings, color codes, and nomenclature (the early authors ingeniously used the word “zone” to describe clusters of documents), the spreadsheet does have a user-friendly format. If you have familiarity with the clinical trial process, then the artifact names and ICH code references will mean a lot to you. #7. The RM can be adapted to simple and complex studies alike. As a former study manager, I remember the days of managing Phase 1 studies and it seemed like they were complete in the blink of an eye. On the other hand, managing the large multi-center oncology studies that never seemed to end were more of a challenge. Fortunately, the document types that should be and may be collected from both of these types of studies are included in the RM. #6. Sponsors and CROs alike can utilize the RM. is collected in a clinical trial. Disclaimer: I highly suggest mapping the RM to your own SOPs to ensure that all required document types are being collected and filed. Therefore when a study is outsourced to a CRO, the sponsor can rest assured that if the RM is followed, there is a master list to check against (of course with professional TMF oversight from LMK). #5. ICH codes are referenced. I know that many of you are used to the ICH Essential Documents list and have used that as a master list for many years. Not to worry, the RM has every ICH code mapped to a Zone, Section and Artifact. #4. With so many columns, filtering is easy! There is a benefit to multiple columns in Excel–the ability to filter! If you are not familiar with the RM, the easiest way to look for a document is to perform a name search within the “Artifact Name” column. Another nice way to search is by ICH code or document level: trial (study), country and site. #3. Most eTMF models are based off of the RM. If you have moved to or if you are thinking about moving to an eTMF solution, most of the eTMF vendor solutions are based on the RM; therefore, migration should be a fairly seamless process. It is even more streamlined with professional management by LMK. #2. The RM was developed and revised by many different TMF Knowledge Thought Leaders. You can probably imagine the time and effort it takes to create a massive Excel tracker. Imagine creating one that can be utilized by the entire life sciences industry! 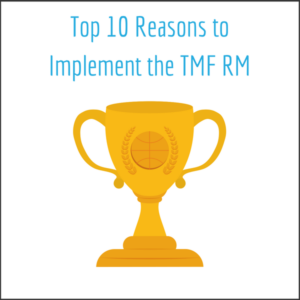 There were many emails, teleconferences and even some face-to-face meetings that occurred to ensure that the TMF RM is a comprehensive tool that can be used across our industry. I know first had as a reviewer of Zones 6 (IP and Trial Supplies) and 7 (Safety Reporting). #1. A process that can be implemented with support! You do not have to try to implement the RM alone. Whether you are in a large corporation with thousands of colleagues or a small company and wear many hats, there are many references to support implementation to the RM. At LMK, our sole focus is on TMF consulting and TMF services. For example, our dedicated professionals can review your Standard Operating Procedures (SOPs) and map them to the RM to meet your individual needs. If you need support with full implementation or general questions, we are here for you. Give your TMF the priority it deserves and contact LMK today to discuss how we can help you with your individual TMF needs.